This exhibition highlights the influence of Muslim scientists, mathematicians and philosophers on our modern understanding of science, medicine, mathematics, architecture, music and the arts. 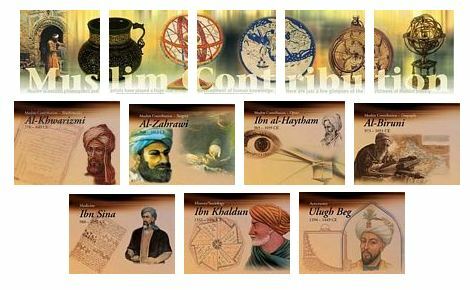 From numbers to medicine to astronomy, in almost all areas of life we can see the impact of Arab and Muslim thinkers of the past, who took ideas from Greece, China, India and many other places, added their own input and passed these on to Europe, giving rise to the renaissance in European thinking. Even everyday words such as algorithm, cotton and tower can be traced to Arabic origin. This set of 12 posters sheds more light on this fascinating subject. For further information on how to purchase or hire this exhibition, please email:[email protected], or call: 0845 087 8766.